Jennie S. Stoltz, 88, of Schuylkill Haven, passed from this life to her Heavenly home Friday, March 15, 2019, after a short battle with cancer. Born at home in Frackville, April 21, 1930, Jennie was a middle daughter of the late Andrew and Josephine Demczak Czebieniak. 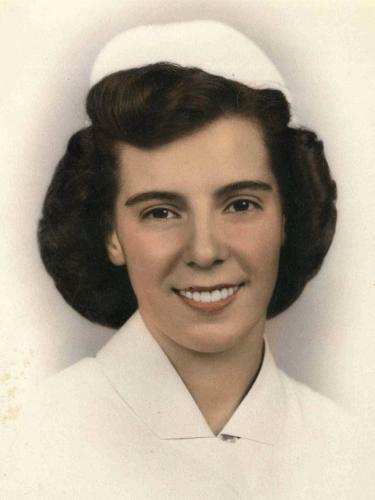 A 1947 Frackville High School graduate and a graduate of the Pottsville School of Nursing, Jennie was employed by the Pottsville Hospital and Warne Clinic as a registered nurse, working most of her career as a nurse anesthetist. She loved her work and her patients and achieved the award for most outstanding nurse for the state of Pennsylvania. She was preceded in death by her husband, Herbert Stoltz, with whom she shared 55 years of marriage; brothers, Terry Czebieniak, Wernersville, Adolph Czebieniak, Easton, and Henry Czebieniak, Frackville. Surviving is her precious daughter, Jan Stoltz, who was also her caregiver and best friend for the last eight years, along with her beloved grandpuppy, Quena, who refused to leave her side. She is also survived by a brother, Walter Czebieniak, Michigan; sisters, Cecilia Kamieniecki, Pottsville, and Florence, wife of Charles Walton, Cressona; nieces and nephews. A Celebration of Life Service will be held at 1 p.m. Saturday, March 30, at Grabowski Funeral Home, 75 Memorial Drive, Schuylkill Haven, with the Rev. Randy Ott officiating. In lieu of flowers, donations may be made in memory of Jennie to The American Cancer Society, P.O. Box 22478, Oklahoma City, OK 73123, or the Alzheimer's Foundation of America, 322 Eighth Ave., Seventh Floor, New York, NY 10001. Memories and condolences can be shared at www.grabowskifuneralhome.com.